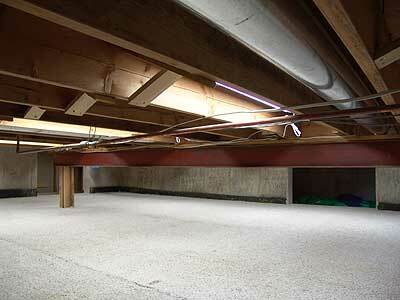 Basement Crawl Space - FINALLY finished! 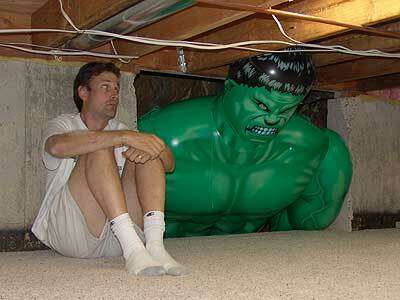 I started work on my basement crawl space back in late/2002, but got side-tracked for a while. Finally, after a long hiatus, I restarted work in early/2005 and actually finished it ... in early May of that year! ;-) I spent a couple of hundred hours on this project, so I could have got it done a lot quicker, but with two kids, copious spare time is not something I have a lot of. It was kinda fun to take pictures of the basement as it progressed and document things, so perhaps this will be useful to others if you decide to finish your crawlspace. In addition to the words and pictures on this page, there are a handful of links scattered with more detailed information for each step. The total cost of materials was less than $1,000, with another $350 to have the concrete cutter guy come out. The bigger project (someday!) 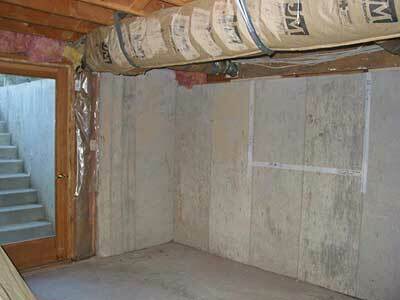 is the rest of the downstairs - take a look at my design for the basement. 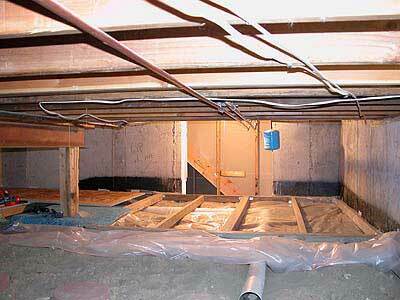 So while this isn't quite a "how to finish your basement crawlspace" guide, it may be helpful to folks doing similar projects. 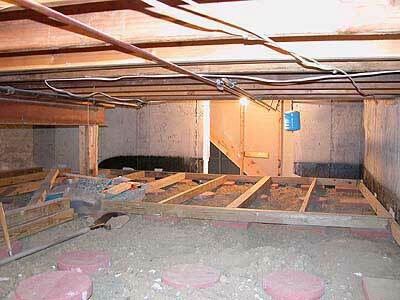 I have a basement crawl space that is unfinished; i.e. 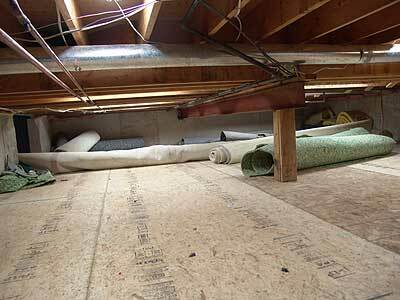 it is just dirt that is about 4' above the foundation floor level and provides about 4' of vertical space between the dirt and the joists (and various pipes, beams, insulation, etc.) for the 1st floor. 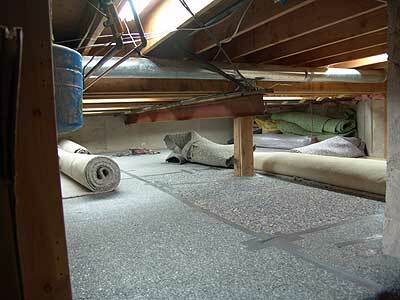 The total square footage is over 400 square feet - 420 to be more exact. 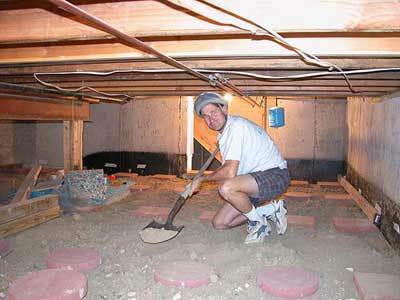 Fortunately for me, the dirt is bone dry, don't have ground water crawl space problems to worry about. 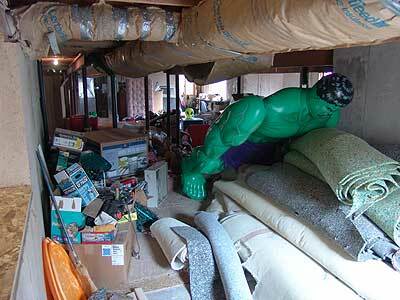 My neighbor DonK mentioned how he had put a floor over his basement crawlspace dirt in a previous house ... so I figured I could do this to at least reclaim this as storage space. 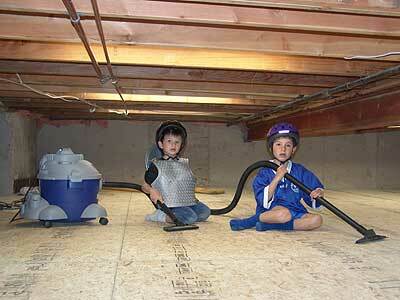 Assuming I was going to use all of this, the first thing I needed to do was improve access to the crawl space. 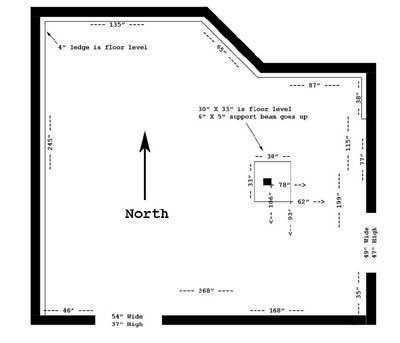 There was only one 36" X 49" hole on the East end which had pretty restricted access due to the stairs being next to it - here is is a large picture of the basement crawl space schematic that is shown on the left. So after thinking about it a bit, I decided to hire a concrete cutter to cut out a similiar size hole for a South entrance. 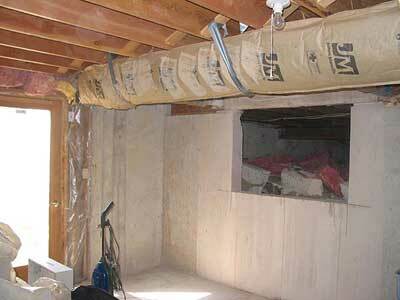 Remember this is a load bearing wall, so I had visions of the house tumbling down into the basement ... but I chatted with my neighbor KeithM, who teaches construction engineering at CU-Boulder who gave me confidence that wouldn't happen - the house is still standing several years later! 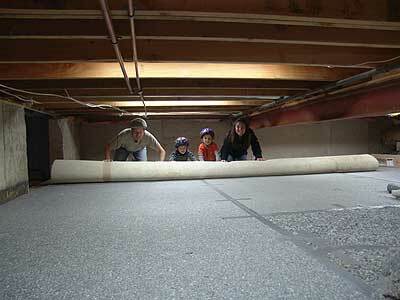 ;-) I measured my ping-pong table which was the determining factor for the width of the hole. 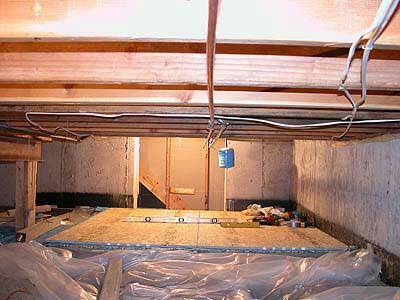 The location was determined by some HVAC vents so I just added a header and some joist hangers. I then needed to determine how far down I wanted to cut ... and this was based on the vertical height of the concrete column in the middle and a ledge that ran alongside about half of the inside walls. I borrowed a laser level from neighbor JohnS which made marking the floor level (and cut height) much easier than doing with a regular level. I also marked the existing East hole to be dropped about a foot. 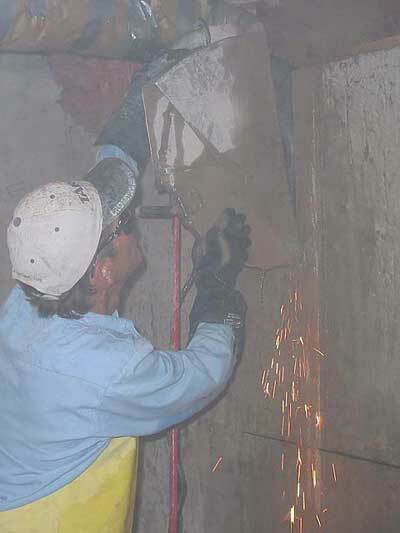 I got some great pictures of cutting concrete in a 8" re-bar basement foundation walls with one BIG saw! It cost me $342, but I could not have done this otherwise. Ironically, 3 years later I would have 20 tons of Colorado stamped concrete poured into my backyard. Suffice to say, this was back-breaking work ... since you are stooped over the entire time ... and I was wearing a bike helmet as one can not help but bump your head against pipes/beams/etc. occasionally. I had dug out/levelled most of the basement crawl space, but rather than finish that job, I was getting tired of doing that stuff ... and wanted to actually lay some floor and see some sign of progress. So I made a monster Home Depot run - even rented their home delivery truck and I completely filled it. 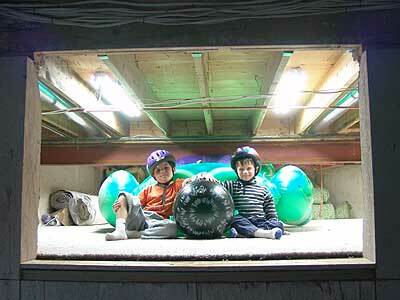 Fortunately, my brother Myke happened to be stopping by ... so I "recruited" him into helping me unload it. The parts list was: Lotsa 12" concrete pavers for the footings, a buncha 8' 2X4 & 4X4's, 13 pieces of 4' X 8' tongue and groove flooring, 50' of 4" corrugated pipe and T connectors (for possible use in active radon system), big roll of plastic (to seal up as best as for radon abatement), and all sort of other misc. 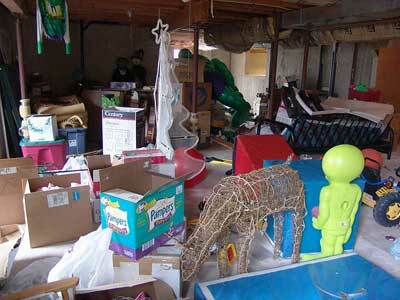 The pile of stuff in the crawl space basement easily reached the 4' from the dirt to the ceiling! There is more details/pictures at the URL below, but basically I semi-leveled the dirt, put the pavers in place spaced every two feet on the "width" of the T&G (with pavers at the ends and in the middle lengthwise), built a frame on top of that, trenched the corrugated pipe below the frame, put plastic below and above the frame (a bit of overkill), and then put the flooring on top to finish the basement crawlspace. 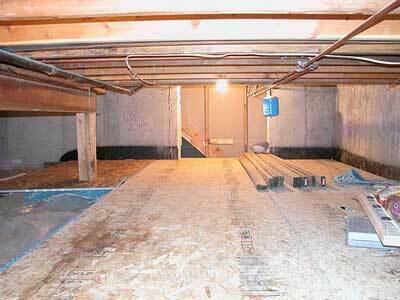 Here are some pictures of the progress I had made as of November 30th, 2002 on my basement crawl space. Deploy rest of pavers, pipe, wood, plastic, floor, etc. I have a buncha of old carpet - roll that out! 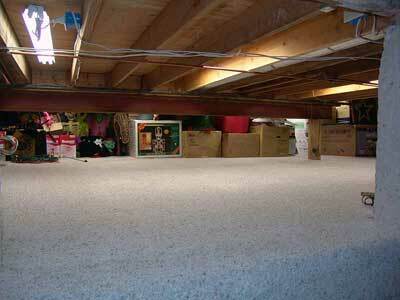 It would be nice to finish so I can store my bazillions of Christmas Lights into the basement crawl space. 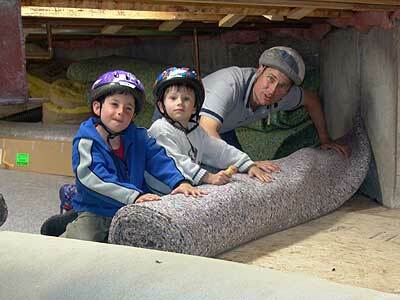 After a couple of year hiatus, I'm back at work in early/2005 and hope to finish the basement. 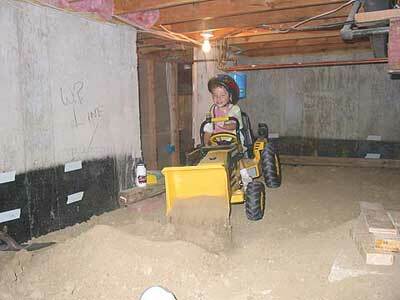 I had to continue digging/leveling dirt, putting down the pipe, plastic, foundation, and floor. 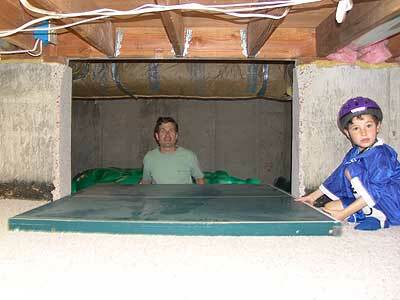 It's a bit of work in the cramped confines of the crawl space. The kids helped me pick up some misc. pieces at Home Depot (they enjoy riding on the big carts), and I found some cheapo $7 shop lights, so I grabbed a bunch of these and installed them - let there be light!. I ended up going back for four more for a total of eight of 'em - argueably overkill, but what do you expect from the guy who puts out bazillions of christmas lights and halloween deocrations! ;-) I wired 'em all up to a 3-way switch, so you can turn 'em on & off from either entrance to the crawl space and put hot outlets next to the switches in case I want power for the crawl space. Before, I had been running extension cords to an outlet in the basement and using some portable lights, so this was a huge improvement. And being a safety type of guy, I put a GFCI in to protect it all in case of a ground fault. It became apparent as I finished up that there was no way I was going to be able to bury the leftover concrete chucks as the dirt level was just about "right" as-is. So I just moved those aside (man, are they heavy!) while I finished up the flooring. Dirk suggested I put 'em out for the garbage man, but I said that just isn't right ... plus this is probably a few thousand pounds of concrete chunks, so I just piled 'em up on a corner floor that had additional foundation beams underneath it. 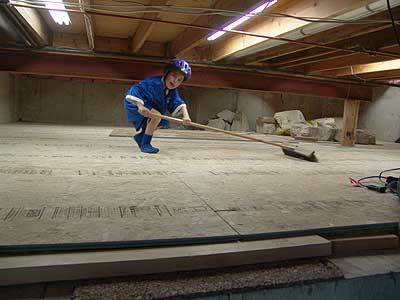 I was curious to see how good a job I'd done of levelling the floor. So I grabbed a $10 laser level from Costco - this model projects both a vertical and horizonal "sheet" (rather than just a single point), so it's ideally suited to assessing how level the floor is. The hardest part is getting the level itself *exactly* level ... but using my best shot at that, it looks like the floor is less than an inch off of level across the 20+ linear feet of the crawl space, which isn't too shabby! 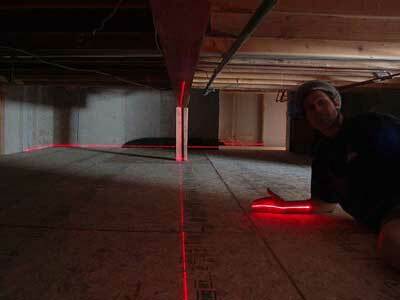 Check out the laser level in action. My neighbor KeithM (Dr. Construction Engineer) was nice enough to come by again for an "inspection" - he said it was a good job and the floors felt real solid, plus the shop lights were a good addition. If anything, I had done an "engineering overkill", which I agreed with but I'll take as compliment! ;-) He said roll out the pad & carpet out and call it a done. 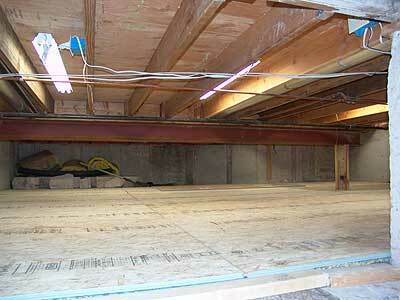 Here's one last look at the end of April/2005 of the basement flooring. I actually did put in some concrete blocks as steps to the crawlspace - will have to shoot some pictures of that one of these days.